One of the most diverse components in design and construction available to the amputee is the gel-liner. A gel-liner is the soft interface commonly used between the residual limb and the prosthesis. Fabricated from a variety of different materials such as urethane, silicone, or thermoplastic elastomers, a gel liner helps cushion the residual limb. To help protect the skin and reduce irratation, several manufacturers have added aloe vera, mineral oil, vaseline, and vitamin E into their prosthetic liners. The most important aspect of a gel-liner to the wearer, is the proper donning of the liner. : To properly don a gel liner, first roll the liner inside out. Next place the liner cupped to the distal (end) of the residual limb, then gently roll the liner into place. Do not try to pull on the liner as this may cause excessive tension on the skin and soft tissue, resulting in an uncomfortable fit. Then add any socks if needed over the gel-liner for a proper fit. graphs below show three of the most common ways to suspend a prosthesis with a gel-liner. 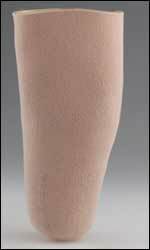 Photo A: a cushion liner, usually worn in conjunction with a knee sleeve and suction. Photo B: a locking liner, with an added pin this liner slides into a locking mechanism fabricated in the prosthesis. Photo C: a seal-on liner, spray the membrane with a water and alcohol mix, then don the prosthesis, air is pushed out thru an expulsion valve to create suction. A few helpful tips about gel-liners. As with any component that makes skin contact hygene is very important. Wash the gel-liner daily with a skin friendly soap and throughly rinse with water. Most skin irratations found with wearing a liner can be traced back to this lack of attention. Also when possible use two liners and rotate them every other day.